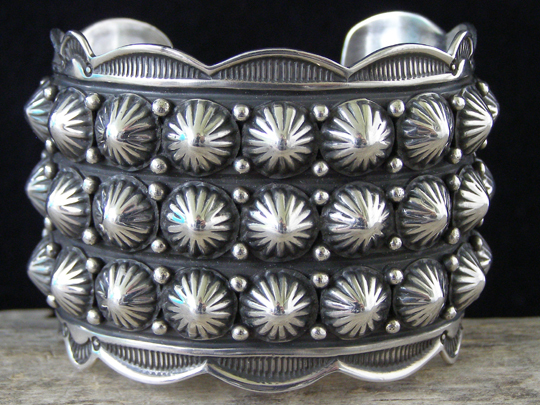 Gene Nataan Deep-Stamped Three-Row Starred Button Bracelet 6 3/8"
This wide, beautifully textured bracelet by Gene Nataan is decorated by three rows of large, textured starred buttons highlighted by deep stampwork which outlines the scalloped edge of the cuff. Small raindrops are interspersed between the large starred buttons adding further texture and a touch of glimmer. This is a beautifully smithed study in texture. Hallmarked N and stamped Sterling inside. Width of cuff: 1 7/8"